With the market sharply moving to megapixel cameras, an increasingly important question is: what MP cameras offer the best low light performance? In this report, we answer this question based on months of field testing. We then take the best performing megapixel cameras and test them against a top SD camera to see how big and what type of performance gap exists between the best low light megapixel cameras and SD cameras. If you take megapixel cameras out of the box and test them for low light performance, the results will be badly skewed - guaranteed. The reason is that manufacturer's default maximum shutter speed vary widely. This is critical because shutter speed determines how long light is captured by the camera. Some manufacturers default to 1/30s, others as low as 1/6s. A camera with a 1/6s default shutter gets 500% more light than the camera with the 1/30s exposure (all things being equal). There is no fundamental difference or technology superiority, just a choice for default. We strongly recommend that all camera tests use normalized shutter speed to make sure that no camera has an unfair advantage based simply on how aggressive their default settings are. And remember, longer shutters can have very bad side affects - specifically motion blur / ghosting. We normalize all cameras to 1/30s shutter for our tests as this matches the normal top frame rate (30fps) for surveillance cameras. You could certainly choose a different level - all images would be brighter (or darker) depending on the level but the relative performance would remain the same. Secondly, it is imperative that cameras be tested simultaneously and under recorded light levels. It is very easy to mistake one camera as being better than another when testing cameras at different times. Most frequently, the problem we see in industry reviews is that the light levels change between tests and the tester/reviewer is unknowingly comparing Camera A's performance at 1 lux with Camera's B performance at 2 lux, drawing erroneous conclusions. Over the last few months, we have done numerous tests - indoors in a dark environment and outdoors at night to determine relative performance. We've tested Arecont, ACTi, Avigilon, Axis, Bosch, Pelco, Panasonic, Sony, Vivotek, etc. UPDATE: We've taken the top performers of this test and did a shootout against Axis's new Lightfinder camera / Q1602. Let's start with our general categorization of megapixel low light performance. Note: 2 things - We are obviously only considering day/night cameras and remember normalized exposure (i.e., be careful of saying Axis is the best, they have one of the longest default slow shutter which skews simple test results). 4MP and 5MP cameras are consistently much poorer in low light than HD/2MP cameras. Specifically, our tests show this of the Axis P1347 5MP, the ACTi 4MP and the Arecont 20MP (a combo of 5MP cameras). The Arecont 1315DN, the Avigilon 1.0MP H.264 5-50mm model, the Bosch 720p Dinion, the Panasonic WV-NP502, the Pelco IXE20DN (non SureVision) cameras were clearly and consistently poorer in low light than other mainstream megapixel cameras. These cameras were much darker than the next group. A number of mainstream megapixel cameras (when exposure is normalized) tend to have roughly the same low light performance. They might be a little better or worse on each take but they are quite close. These cameras include the Axis P1344, the Sony CH140 and the Panasonic WV-NP306. Of the three, the Sony CH140 is regularly slightly worse than the Axis and Panasonic but the Sony is still consistently better than the cameras in the below average group. This is a strange categorization but we are seeing a strange phenomenon. The new Pelco SureVision and the new Bosch 1080p are both notably brighter than other megapixel cameras in low light but the overall details delivered are generally not that much notably better. On the one hand, people like bright images. On the other hand, if the brighter images do not deliver increased details of people, vehicles or objects, the practical value is questionable. This is especially important in considering the Pelco SureVision whose brightness and digital noise artifacts are significantly higher than others. We compared the performance of the brighter category cameras - Bosch 1080p and Pelco SureVision to the SD Bosch NBN-498, widely regarded as one of the top low light performing cameras. The results were fairly close with the SD camera only being modestly brighter and delivering modestly more image details. However, in our follow up shootout against the Axis Q1602, none of these cameras were able to match the new Axis camera. Let's start with a review of 4MP and 5MP cameras. 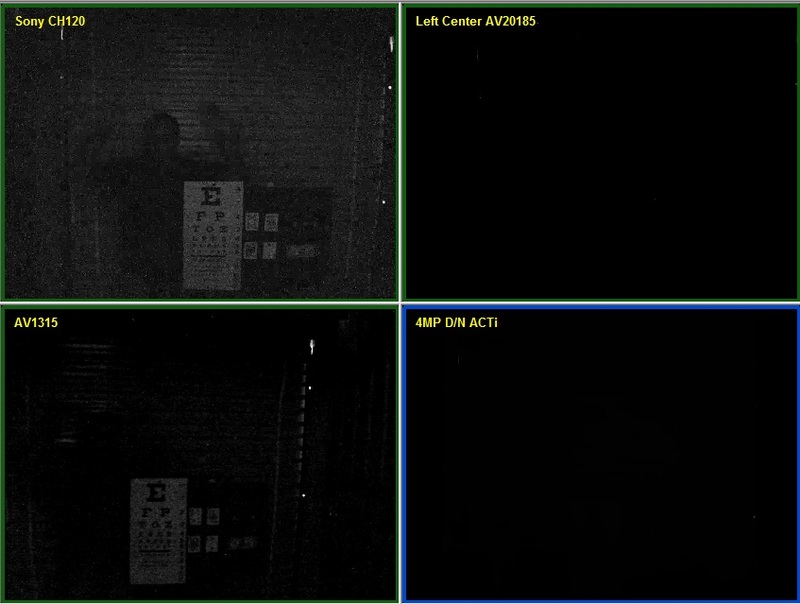 On the right side of the image below are results for the 4MP ACTi and the 20MP (4 x 5MP) Arecont Vision cameras. In our 0.3 lux lighting conditions, both cameras are pitch black and nothing can be seen. Contrast it to the 1.3MP cameras on the left that at least make out some of the scene. Remember that the Sony CH120 and the Arecont 1315 are not even the best low light performing cameras. With images this dark the ACTi 4MP and the Arecont 20MP raise real practical problems for night time monitoring. Now, if you take the 5MP Axis P1347 out of the box, it will actually look better for still subjects. However, this is little more than a default configuration trick. As the image below shows, in the same scene as above, Axis's default 1/6s shutter makes the 5MP appear to have much better low light performance than it competitively delivers. Now, let's turn to Avigilon's H.264 1MP 4.7-84.6mm f/1.8 camera. In the image below, the Avigilon on the far right is quite dark and clearly much darker than the competitor cameras. Two things to note with this Avigilon camera: (1) Avigilon has a newly released 3-9mm H.264 1.0 MP camera that claims much better low light performance. (2) UPDATE: Avigilon's H.264 cameras now support slow shutter up 1o 1/4s. In the image below, the Arecont AV1315DN is notably darker than the Sony. Also, important to note, Arecont's AV1315DN was the worst bandwidth hog in our low light testing (with Axis's color only M1114 next) with bandwidth consumption easily surging over 10Mb/s. 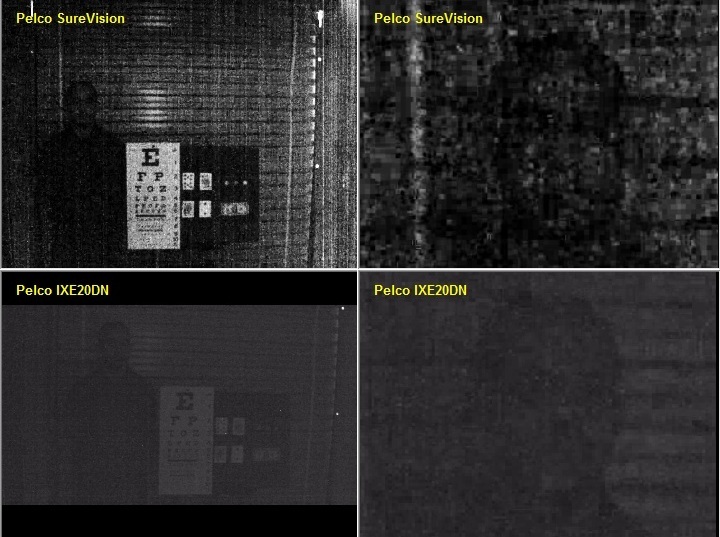 Below, is a comparison of Pelco's previous generation IXE cameras and their new SureVision camera. On the left side is an overview shot of each camera and on the right side we've zoomed in to the subject's head. This comparison shows the good and bad of Pelco's new generation of cameras. SureVision is clearly far brighter than their previous generation but with so much visible noise, the additional details delivered are modest. While Bosch has strong low light performance in both their SD and 1080p models, their 720p camera is nowhere close. The sample below shows the 720p conspicuously bad performance in the middle of the comparison. This is a good reminder of the limitations on choosing simply by brand as camera performance even within a line can vary significantly. Our test results of the color only entry level Sony 720p vs 1080p cameras provide another good example of this. The comparison below show 6 cameras from Axis, Bosch, Panasonic and Pelco together. Clearly, the standouts are how dark the Panasonic 502 is and how bright the Pelco SureVision is. Now, let's zoom into the eye charts to take a closer look. The Panasonic 502 is the worst, by far. Next is the Sony CH140 which captures some of the letters but clearly less than the other cameras. The best might be the Bosch 1080p but the Axis P1344 looks close (in terms of reading smaller lines on the chart if not overall brightness). Finally, let's compare to the Bosch SD camera. In the first of 3 comparisons, let's look outside in a relatively dark field (~0.5 lux). The overall brightness of the 3 images are close with the Pelco SureVision being even brighter than the Bosch SD. However, looking at our subject's pants (who is wearing blue jeans), you can see how aggressively and artificially the SureVision is brightening the scene (making the pants look like white khakis). Now, let's zoom into facial details. Of the 3, the Bosch 1080p delivers the most detail with more sharpness in the eyes, noise and collar captured. The SureVision, despite its brightness delivers the least amount of details. Now, let's switch back to our 0.3 lux indoor testing with a zoomed in comparison of the 3 cameras. In this even lower light scene, all the camera's images are darker. Now, the SD Bosch provides a moderately brighter and more detailed image. The Pelco SureVision captures the least details and demonstrates how sizable its visible noise reaches. Lastly, here is a comparison in color mode - same scene, same 0.3 lux light levels but the cameras have been forced into color. While black and white is typically accepted at night, this comparison shows two notable points: (1) image quality captured is degraded (as expected) and (2) the Bosch 1080p shows no color. We confirmed with Bosch that this is by design. While it might deliver more details, it makes color mode fairly useless as only grayscale is actually displayed.